A decibel is used to measure the level or intensity of a sound, and for every 3 decibels, the sound is twice as loud. Not all firearms produce the same level of noise. For instance, a .22 caliber rifle will produce a noise level of approximately 145 decibels, while a 44 revolver will raise the level to about 170 decibels. Most other firearms will fall somewhere between this range. Sounds at 140 decibels or louder can not only cause pain and ringing in the ears, but they will also cause permanent hearing loss and damage. To put it in perspective, a whisper is about 20 decibels, while busy traffic is approximately 80 decibels. A rocket launching is around 180 decibels. But even prolonged exposure to any sound much more than 85 decibels can cause hearing loss. 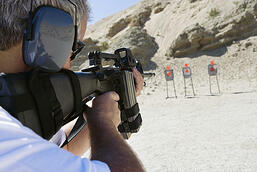 It's easy to see why hearing protection is crucial when using firearms. If your ears ever start ringing while shooting, stop immediately and get to a quieter area; this means that hearing damage has already started occurring. There are primarily two different types of hearing protection. These include earplugs and earmuffs. Earplugs are generally better than earmuffs at reducing sound. They both reduce between 15 to 32 decibels of noise. Noise reduction rating (NRR) is a rating method used in the United States to evaluate hearing protection. The NRR rating is the number of decibels sound will be reduced by when worn appropriately. Wearing a combination of protection, such as plugs and muffs, would increase the NRR rating, -- and the overall level of protection -- and may be required to prevent hearing damage in some shooting environments. Some individuals are willing to wear hearing protection while at the firing range, but they may hesitate to use it while hunting. They may argue that they need to hear approaching game or other noises in the environment. There are types of hearing protection on the market that allow hunters to hear softer noises while still protecting them from louder sounds that may damage hearing. Nonlinear and electronic earmuffs are two such hearing protection devices that have been developed for hunters. Considering how easy it is to damage and permanently lose our hearing, wearing some sort of hearing protection device is crucial when using firearms. With the variety of protection to choose from, those using firearms should be able to find a type and style that best fits his or her specific needs.